Another interesting documentary to look out for is Ellas, Filipinas, produced by Marisa González. 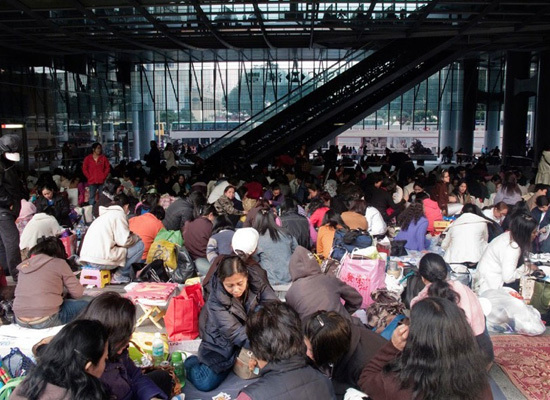 In Hong Kong, 120,000 to 200,000 women from the Philippines work as domestic helpers. They are women that have sacrificed their personal life to give their own family, their children, a better life and education. They do not have private life. They suffer racism, and in many cases exploitation. In their only day off, Sundays, they invade the downtown financial and commercial district, where they transform and occupy the streets, bridges, parks, plazas, shopping centre, the main commercial street, and also the emblematic building of the HSBC Hong Kong Bank. These women change the meaning of the commercial public space, where they transport their habits and traditions through leisure, rest, religion and culture. The luxury downtown city on Sundays becomes a domestic space where they meet, rest, eat, dance, play cards and pray. They impose different codes into the space, building a new and unique human cartography. Their location is precise, constant. We haven't yet seen this 1-hour documentary, but we're sure it will profoundly resonate with us, as our own immediate and extended family history abounds with stories of displacements. Ours is a transnational family whirled about the world by the diasporic forces of globalization. This testimony given to the filmmaker by Cecilia, a nurse who has been working in Hong Kong for 10 years, is typical. I left my home in the Philippines because I needed the money to maintain my family. Working as a domestic helper I could pay the medical studies of my daughter, the education of my five brothers and sisters and the medical assistance of the cardio problems of my father. But it is difficult to explain the bitterness and the great sacrifices of our lives. We all feel very lonely. We live far away from our husbands, from our sons and from all our loving friends. We do not have our own family life nor a social or cultural environment. It is an immense sacrifice that we do not deserve, even if we are poor. We also suffer discrimination and abuse in our work during the long daily hours. We must have high school or university studies but we are treated as servants. In most cases we are more qualified than our Chinese employers. We have only two weeks of holidays every two years of work. Only every two years we can visit our sons, our family. On Sundays we are happy when we invade the open spaces of Hong Kong and meet together to remember our identity and our culture. It is the only day in the week that we can do our personal things like shopping, go to the bank to send our salary to our families, go to Church and send boxes back home full of clothing, shoes, books, toys. This is our only physical contact with them. We can laugh, sing, dance, eat and share between women our happiness, friendship and the solidarity that we miss in our domestic work. On Sunday we feel happy in foreign land. The parks and streets of the financial district of Hong Kong become Filipino territory, like the plazas of our little towns. 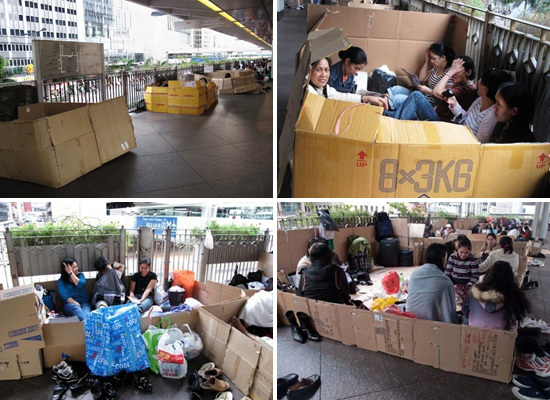 The HSBC Bank is our cathedral and the cardboard casitas are our home. But we are homeless women. At 8 or 9 in the evening we have to return to our job. We cannot sleep at the houses of our employers. It's interesting to point out the HSBC Bank that Cecilia refers to above. Designed by Norman Foster, its public space was created with a specific urbanist purpose, as as financial and commercial center of the city. An area that otherwise might be empty and abandoned on weekends is instead turned into a bustling small town, somewhat autonomous from the city and with its own parallel economy of exchange and transactions. For related reading, check out Rhacel Salazar Parrenas' Servants of Globalization: Women, Migration, and Domestic Work, which briefly explores similar transient spaces by a similar immigrant community group, but in Rome and Los Angeles. Particularly in Rome, they congregate at Santa Pudenziana, the national church of the Philippines; the parking lots of Mussolini's EUR; Metro stations; and crowded post-war tower block apartments on the periphery. In these pop-up piazzas temporarily dotting the eternal Papal and Fascist grid, Filipinos seek relief from feelings of exclusion both from their host country and distant families, find solidarity with their fellow countrymen, and commit acts of resistance through fugitive visibility. I just got back from a trip to Hong Kong and saw the groups of Filipino women hanging out on their Sunday off, playing cards, napping, eating and relaxing. Seeing the thousands of women out in the public is very visual reminder of how power plays out in the global labor landscape. I'll have to check out this documentary. Thanks for the recommendation.